BROWARD COUNTY, FL - Broward County&apos;s Port Everglades is gaining a Northern European ocean-shipping route as the 2M Alliance begins service with Wednesday calls starting on August 16, 2017. The 2M Alliance is a vessel sharing agreement between Maersk Line and Mediterranean Shipping Co. The 2M Alliance "TA1/NEUATL1" new service rotation will be Antwerp, Belgium; Rotterdam, Holland; Bremerhaven, Germany; Norfolk, VA; Port Everglades, FL and Houston, TX, Norfolk, VA; then back to Antwerp. The services will be exclusively aboard US-flagged Maersk vessels. "This Northern European service further diversifies the fleet and services that call at Port Everglades, and generates additional opportunities for international trade to and from South Florida," said Jim Pyburn, Director of Business Development for Port Everglades. At the crossroads of north-south and east-west trade, Broward County&apos;s Port Everglades is Florida&apos;s leading container port, handling more than one million TEUs (20-foot equivalent units, the industry standard measurement for container volumes) and serving as a gateway to Latin America, the Caribbean, Europe and Asia. Located within the cities of Fort Lauderdale, Hollywood, and Dania Beach, Florida, Port Everglades is in the heart of one of the world&apos;s largest consumer regions, including a constant flow of approximately 110 million visitors statewide and 6 million residents within an 80-mile radius. Port Everglades has direct access to the interstate highway system and the Florida East Coast Railway&apos;s 43-acre intermodal container transfer facility, and is closer to the Atlantic Shipping Lanes than any other Southeastern U.S. port. Ongoing capital improvements and expansion ensure that Port Everglades continues to handle future growth in container traffic. A world-class cargo handling facility, Port Everglades serves as an ideal point of entry and departure for products shipped around the world. 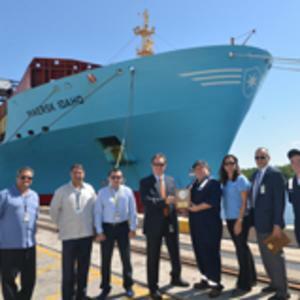 (L-R) Javier Miranda and Richard Rovirosa, Port Everglades Terminals; Paris Penaherrera, MSC Mediterranean Shipping Company (USA) INC.; Jim Pyburn, Port Everglades Business Development Director; Maersk Idado Captain Mark Stinziano; Michelle Porter, Maersk Line; Robert Barcelo, Port Everglades; and Maersk Idaho Deck Cadet Matthew Greenspan.